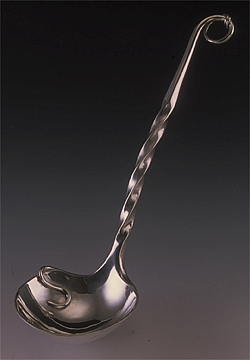 Jim Cohen is a studio metal smith and adjunct professor at the University of New Mexico residing in Santa Fe, New Mexico, teaching Art Metals. Jim took up metal smithing after a career as a lawyer, first on active duty with the Air Force and, after his retirement, with the Air Force General Counsel’s office. Jim’s area of emphasis is judaica. He is most proud of the breastplate and yad he made and donated in support of the Jewish Welfare Board’s “Torah for the Troops” fundraising program. Those pieces are on board a Navy carrier. Much of my work deals primarily with line and line quality. I look to make a line, through manipulation by hand or hammer, come alive in original forms. I strive for lines that breathe life into objects and give viewer’s a new life experience: discovering anew objects by embracing their whimsy, aesthetic and function.I seek lines that infuse everyday objects, such as spoons, vessels and rings, objects of common day-to-day life and relationships, with uncommon fun and celebration. 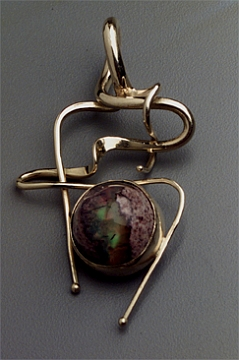 My mantra is “whimsy-aesthetic-function.” I try to imbue each piece I make with those elements. I want the viewer to see the piece as more than what it appears to be and to enjoy the piece visually, functionally and intellectually. For more information, visit Jim’s website.